Chamomile can be grown in your home garden annually, just make sure that you give this beautiful plant plenty of room to grow. Take the dried flowers, whole or crushed, and steep them in hot water for about 5-10 minutes. Serve with lemon or honey. Chamomile tea is great for stress, relaxing nerves, and trouble sleeping. Talk about a fresh start! Mint is easy to grow but can take over an entire home garden if not potted properly or placed in a controlled area. Mint can be used to make hot or cold tea and makes a refreshing iced tea drink on a hot summer day in June. Mint is great for indigestion and can be combined with a wide variety of other tea leaves like rosemary or lemon basil. Speaking of rosemary, the leaves of this kitchen essential can be used for both cooking and for making tea. Rosemary grows on bushy-like stems and works best in well-draining soil so when harvesting, remember to cut the entire stem but only use the leaves for tea. Rosemary tea assists with alertness and memory, making it a great alternative to caffeine. Rose hips are a bit tougher to grow but if you are successful you’ll reap the benefits tenfold because these plants are actually perennials, meaning that they will continue to blossom roses and rose hips every year thereafter. However, you must remember to leave the roses themselves intact (easier said than done!) if you want rose hips to grow. Strain before serving because rose hips have seeds and hairs in them. Borage, known as the “herb of gladness”, is a hearty plant that is extremely easy to grow and keep alive. Direct sunlight is actually encouraged, which will result in beautiful blue flowers blossoming. Dry the leaves and flowers to make a soothing hot herbal tea that has anti-inflammatory properties, as well as benefits for colds and coughs. To avoid scratches from the prickly hairs, wear gloves when harvesting your home garden for borage. 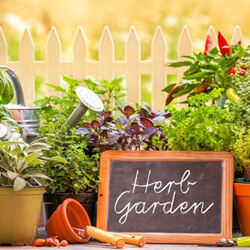 These are just five of the countless herbs you can grow yourself in a home garden. Trust us when we say that there are so many more ways to enjoy a fresh start in your home by utilizing DIY projects such as these. For more informative blogs from 911 Restoration, go to the “do-it-yourself” section of our homepage now!